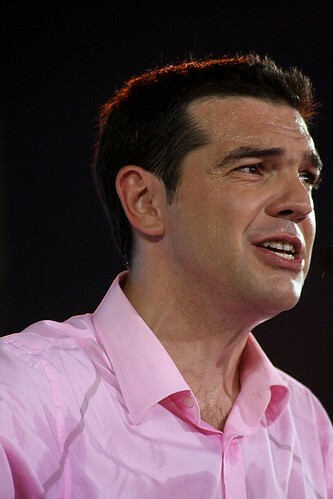 Alexis Tsipras addressing campaign rally in Thessaloniki, Greece, a photo by Teacher Dude's BBQ on Flickr. Last night I attended SYRIZA's last campaign rally here in Thessaloniki and for the second time in a month I saw their leader, Alexis Tsipras address the party faithful in the central Aristotelous Square. However, the difference between Tsipras last appearance here and this one shows just how much Greece's political scene has changed in the previous four weeks. Then, SYRIZA was seen at best, the third largest party with opinion polls putting their vote as low as 7 or 8% (In the May election their share of the vote reached nearly 17%), but now it seems the they are poised to become the largest party with anything up to 31.5% of the vote if some polls are to believed. In the meantime the party and its leader has become the centre of unprecedented media attention, both at home and abroad, and most of it has been highly critical,as SYRIZA threatens to upset the austerity program crafted in Brussels, Washington and Berlin by the EU,ECB and IMF. 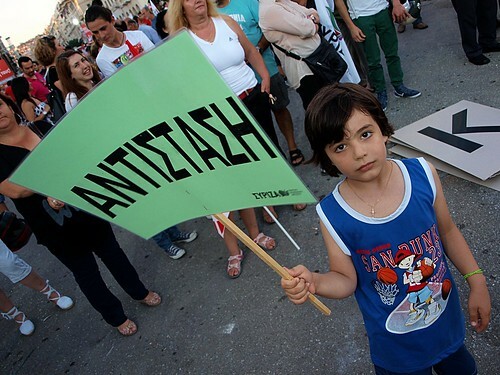 The possibility of a radical leftist party taking power in an EU nation has driven some sections of the media into a veritable frenzy of hyperbole and fear mongering, culminating in the German edition of the Financial Times calling upon Greeks to resist demagogues (With the title written in Greek as well just to make sure the message would not go amiss). The result has been a field day for anti-austerity parties who used the article to rally support for their policies. Even New Democracy leader, Antonis Samaras was forced to take issue with the article as a gross intervention in Greek internal affairs. Another factor which has benefited SYRIZA is the continued disintegration of the centre left PASOK party who were, until recently their main political rival. Under the inept leadership of Evangelos Venizelos, they look set to lose even more votes than their disastrous 13% showing in May (down from 43% in 2009). Video of Venizelos having a very public meltdown on live TV after being asked by a member of the audience about corruption just added to the impression that PASOK has lost touch with its traditional base. The change in fortunes for SYRIZA was reflected in Tsipras's speech which was bold and clearly aimed at reaching out to those who until recently would never have even considered voting for them. Instead of shying away from media attacks, Tsipras tackled them head on, accusing both PASOK and New Democracy of offering Greek people nothing but fear. Not usually an electrifying public speaker, this time the leader of SYRIZA upped his game and gave a performance reminiscent of the kind of firebrand speeches that used to be part and parcel of Greek electioneering. A far remove from the bloodless style of public delivery preferred by previous prime minister, Giorgos Papandreou who was widely derided for his wooden public addresses. At time of writing "secret polls" which I cannot blog about (due to a law that forbids their publication for two weeks prior to elections) favour New Democracy, as do Greek and UK bookies. However, if their accuracy is anything like the previous examples such predictions mean little. By the end of Sunday, whoever wins one thing will be sure, that the trials that Greece has faced over the last three years will not have disappeared. Should SYRIZA come first they will have to form a government and then deal with a Europe determined not to budge over the terms of further cash injections. On the other hand if New Democracy comes first they will have to cobble together a coalition from disparate parties all of whom will have to foist upon their voters yet more public spending cuts and tax hikes. How long such a fragile alliance will last in such hostile economic conditions is open to debate and probably mean elections once again before the year is up. I think the fearmongering will have the desired effect and ND will win. But here's hoping.